William D. Friedman became president and CEO of the Cleveland-Cuyahoga County Port Authority in June, 2010. Under Mr. Friedman’s leadership, the Port of Cleveland has experienced a resurgence in maritime trade and long-sought diversification of cargo types. In 2014, the Port launched the Cleveland-Europe Express service, revitalizing shipping via the Great Lakes/St. Lawrence Seaway system and solidifying Cleveland’s position as its leading international hub. Mr. Friedman has more than 25 years experience in port management, real estate development, the international supply chain and multimodal distribution. He served as vice president, ports and logistics for Duke Realty Corp. from 2004 to 2009, helping the company expand to key port and inland logistics hubs including the Port of Savannah and the Rickenbacker Global Logistics Park in Columbus, Ohio. Before joining Duke Realty, Mr. Friedman was CEO of the Ports of Indiana from 2000 to 2004, where he improved financial results, increased cargo volumes, and secured more private investment, resulting in a record $1.5 billion annual economic impact statewide. 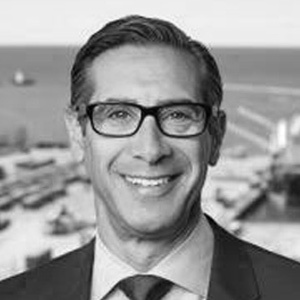 Prior to that, Mr. Friedman spent 10 years with the Port of Seattle serving in a variety of management roles including director of seaport strategic planning, general manager of cargo piers and industrial properties, and senior harbor development planner. Mr. Friedman’s work in Seattle enabled a $600 million expansion of one of the nation’s primary container ports. Mr. Friedman is President of the American Great Lakes Ports Association and serves on numerous industry and civic boards including the Executive Committee of the American Association of Port Authorities, Green Marine, the Northeast Ohio Development Fund, the Northeast Ohio Areawide Coordinating Agency, and the Cuyahoga County Economic Development Commission. Mr. Friedman holds two degrees from Indiana University – a bachelor’s degree in history, and a master’s degree in public administration with a concentration in urban and regional planning.